Congratulations to the Atlanta 3-Day Milestone Award Winner, Mary Anne W.! 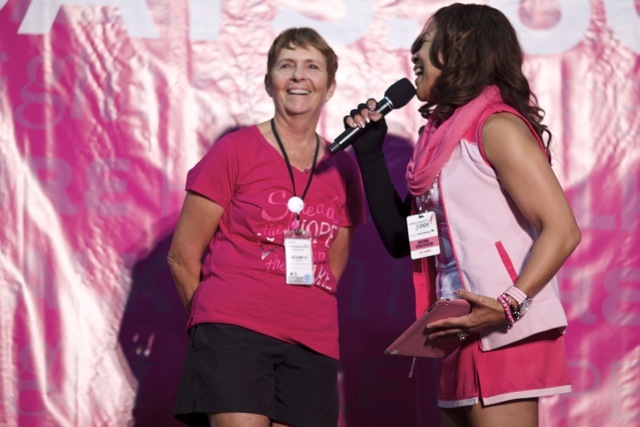 Please join us in congratulating Mary Anne W., the Susan G. Komen Atlanta 3-Day Milestone Award Winner! This is Mary Anne’s 12th year with the Komen 3-Day, and her 12th event. She has raised a lifetime total of a staggering $74,900, and is the Team Captain of the Breast Defense League. Mary Anne first got involved with the 3-Day in 1998, when a co-worker challenged her to participate. “I had no idea what I was getting into,” Mary Anne laughed. Mary Anne has been participating in the 3-Day since 1998, when it was in Santa Barbara. She’s walked all over the country, including Los Angeles, San Diego, San Francisco, Seattle, and Washington, D.C.
Like so many others who are involved with the 3-Day, Mary Anne calls the 3-Day a “life-changing experience”. Over the years, she has met so many walkers and made friends from all walks of life. Her 3-Day friends are above and beyond other friendships in her life, a belief we find that is shared among all members of the 3-Day. Please join us in thanking Mary Anne for her dedicated service to the 3-Day, and for helping us continue the fight in a world without breast cancer. We will never give up! ← Congratulations to the Atlanta 3-Day Top Fundraisers!